This page summarizes the evolution over the years of Asimo, Honda's robot. Here's an Economist article about the "eight-hour myth"—the widespread belief that we all need eight hours of sleep every night. The bottom line is: Don't stress if you're getting less than eight hours of sleep each night. A big part of insomnia is psychological: If you think you're getting enough sleep, then you probably are. But if you start stressing about how much sleep you're getting, then that stress can not only create a self-fulfilling viscious-circle prophesy (worrying about sleep keeps us awake, which makes us worry even more about sleep, and so on), but can actually be more damaging than the lack of sleep itself. Did you always want to know how to sharpen a samurai sword? If so, you're in luck! This page explains the process in English. Here is a list of sound effects used in Japanese manga and what each means. The Japanese language is rich not only in onomatopoeia (called giongo), which represent sounds and actions (such as "buzz" in English) but also in what are called gitaigo—mimetic words that primarily represent emotional states. For instance, shun represents a feeling of being lonely or forlorn, whereas niya niya suggests a sly grin. In fact, I've always considered gitaigo to be one of the last hurdles to complete fluency in Japanese. In a previous posting I linked to a video of American geeks pilgrimaging to Japan for animation-related stuff. Finally, the news all you old fogies (like me) have been waiting for: You can play the classic arcade game "Frogger" online! What the heck. It's Friday. Doctors are testing a new, non-drug treatment for asthma: "snaking wires inside the lungs of asthma patients to essentially burn off some of the tissue that blocks their ability to breathe." Schools are beginning to experiment with meditation as a non-drug way for students to deal with attention deficity hyperactivity disorder (ADHD). Want to grow your own square watermelon? Essentially all you need is the right sized box, as shown in this photo. Here is a previous post about square watermelons, a novelty that apparently started in Japan. 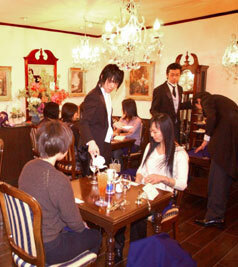 Butler cafes, where a predominantly female clientele is served by waiters dressed like 19th-century English butlers, are a new trend in Japan. This is an interesting article about the differences between American automakers and the American operations of Japanese car manufacturers when it comes to their retirees. All three Japanese companies are anticipating that the ranks of retirees will swell over the next several years. Toyota's American arm, for example, has just 258 retired production workers (G.M., by contrast, has more than 400,000 retirees). But things will change over the next five years. In 2011 and 2012, a combined 1,700 workers will be eligible for retirement at Toyota — about 6 percent of its current labor force. Previously I wrote a post about studies showing that visits by dogs increased heart attack victims' chances of survival. Now, another study warns that 80 percent of these "therapy dogs" may carry diseases that are infectious to humans. Here's a real time saver and stress reducer: a website listing hard-to-find customer-support phone numbers. The top 5 numbers are for Amazon.com, Ebay.com, PayPal.com, Yahoo.com, and Microsoft.com. The National Institutes of Health recently announced they could find little evidence that vitamin supplements work. Asashoryu beats Chiyotaikai in this 43-second clip from Day 13 of the spring basho (tournament). The commentary is in English. The Japanese government PR magazine Asia-Pacific Perspectives: Japan+ has an article titled "60 Years of Postwar Progress". The article's a nice summary of how Japanese has changed in the 60 years that have passed since the end of WWII. There are plenty of pics, such as the one below showing the living room of a typical middle-class family in the late 1950s. And what does Brain Training do? Well, you hold your Nintendo DS like a book (with left and right screens), and you basically use the touchscreen to undergo a wide variety of simple, cleanly-designed, interesting exercises intended to make you smarter. Or, at least, keep your brain sharp and fresh and delicious. At the end of your "fun", the game eventually calculates and reports your "mental age" — often with painful/comedic effect — and tracks your progress over the weeks and months of self-education. And that's about it. Of course, no video game can take the place of actually going out and doing something. See previous posts on the topic of brain training here. Here's a Korean TV commercial for a bottled ready-to-drink green tea. The commercial is obviously aimed at young people, and it reminds me of what Mr. Nagata said about the sad trend among young people in Japan today to see green tea as something that you buy in a bottle, not something you brew yourself. Notice that the plastic bottle in commercial is colored to make the tea look ultra-green. Another thing that the commercial doesn't tell you is that a lot of the polyphenols in green tea start to break down within a few hours of brewing, so that by the time that bottle of tea reaches you, it's lost of lot of its health-promoting "punch". So don't succumb to the temptation of bottled tea—it's healthier to brew your own. The whole tea-brewing process is also an excellent opportunity to take a step back and relax. Green tea isn't just a drink; it's an experience. A cat says "Meow" in English but "Nyan" in Japanese. A list of these and other animal sounds in various languages can be found here. Scientists based at the Satou hospital in Japan found that kissing worked by relaxing the body and reducing the production of histamine – a chemical that the body produces in response to pollen, causing the sneezing, runny noses and streaming eyes that characterise hay fever attacks. The move is hitting hard at the Japanese, who use up a tremendous 25 billion sets of wooden chopsticks a year — about 200 pairs per person. Some 97 percent of them come from China. But pretty soon, some fear, Japan won't even be able to get expensive chopsticks from China: Japanese newspapers Mainichi and Nihon Keizai reported that China is expected to stop waribashi exports to Japan as early as 2008. Teahouses that combine the traditional with the modern are making a comeback in China. In short, tea, after years of being highly uncool, is becoming trendy, particularly among the country's young, affluent crowd. It's always interesting when a scientific study proves something we already knew intuitively. Meditation not only is a cost-free, drug-free relaxation technique; it can also make your brain bigger. The Tea Association of the United States has a page on how to read tea leaves, complete with an illustration (see below). Who knew there was an actual technique to this. I thought tea-leaf-readers and other fortune tellers simply made it up as they went. Music hath charms to sooth the savage beast ... and to relieve stress, especially when it's good music. Here's a video of two old-school country music legends, Johnny Cash and Charley Pride, doing a medley of Hank Williams songs on "The Johnny Cash Show." This espisode originally aired on September 6, 1969. Here is a listing of all the posts I've written about the book Green Gold: The Empire of Tea . The book is about the the British Empire's discovery and commercialization of tea, and the impact that business had on the empire. Erin Hoffman hardly saw her husband, a video-game programmer who worked 85 hours a week. Upset with what she saw as a "culture of overwork," she began blogging (under the name "EA Spouse") to express her frustrations. The blog struck such a chord that it was wildly successful. Now Erin looking for a publisher for the book she's written about overwork. Here's a video of a teapot shaped like a steam locomotive. Watch to see what happens when the water boils. Here's a subtitled Japanese TV commercial for green tea. Seems everyone wants Top Leaf. When Natick Labs chemist Ferdinando Bruno began researching potential uses for a component found in green tea, his goal was simple: build an efficient and light plastic battery to power equipment used on the battlefield. Bruno never dreamed he would instead find a new cancer treatment that may heal patients without the painful side effects associated with most forms of chemotherapy. treating colorectal cancer and cancer of the breast, head, and neck. From Google Video: a video clip from Japanese TV featuring anime otaku ("animation geeks") from America pilgrimaging to the motherland. Their goal? To buy much-coveted anime products, sing anime-themed karaoke, and attend anime conventions dressed as their favorite characters. Here's an excerpt of a National Geographic article about caffeine. "The principal reason that caffeine is used around the world is to promote wakefulness," [Harvard Medical School neurologist Charles] Czeisler says. "But the principal reason that people need that crutch is inadequate sleep. 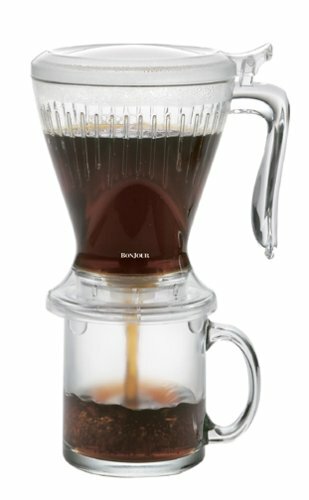 Think about that: We use caffeine to make up for a sleep deficit that is largely the result of using caffeine." A sign of green tea's growing popularity in the United States: Starbucks (no hissing, please) reports that a strong showing for green tea beverages was a major factor in a 27 percent rise in quarterly profits. Besides, can you even taste the green tea in a green tea latte? Come out of the darkness and into the light, o drinkers of green tea lattes! Here is a concise, well-written article that covers all the basics about green tea—where it fits in the tea pantheon, how it's good for you, plus a few recipes. Sometimes we stress too much about being stressed. In keeping with that sentiment, here is one quiz-obsessed writer's smart-allecky replies to a typical stress test.